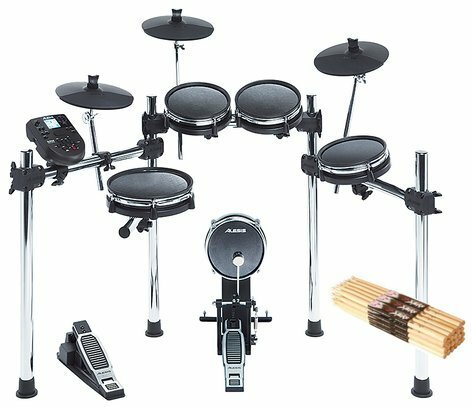 Rock away with this awesome 8-piece electronic drum kit! Mesh head drums are the proven best choice with electronic drummers for their natural feel and ultra-quiet response. Rock away with this awesome 8-piece electronic drum kit! Mesh head drums are the proven best choice with electronic drummers for their natural feel and ultra-quiet response. The all-mesh heads deliver a real feel that you won't find for this cost, and the inclusion of a 12-pack of drumsticks makes this a great deal! Alesis Surge Mesh Kit - a complete 8-piece electronic drum kit featuring dual-zone mesh head toms, dual-zone mesh snare drum, and 8” mesh kick pad. Case: 11.76" x 20.88" x 40.20"
Product: 43.32" x 27.60" x 47.28"